Très joli ! J’aime le piquant du rose. Merci beaucoup! C’est une de mes couleurs préférées (parmi tant d’autres)! Beautiful and the button band looks amazing. Worth the effort! Wow, the colour and pattern go so well together! 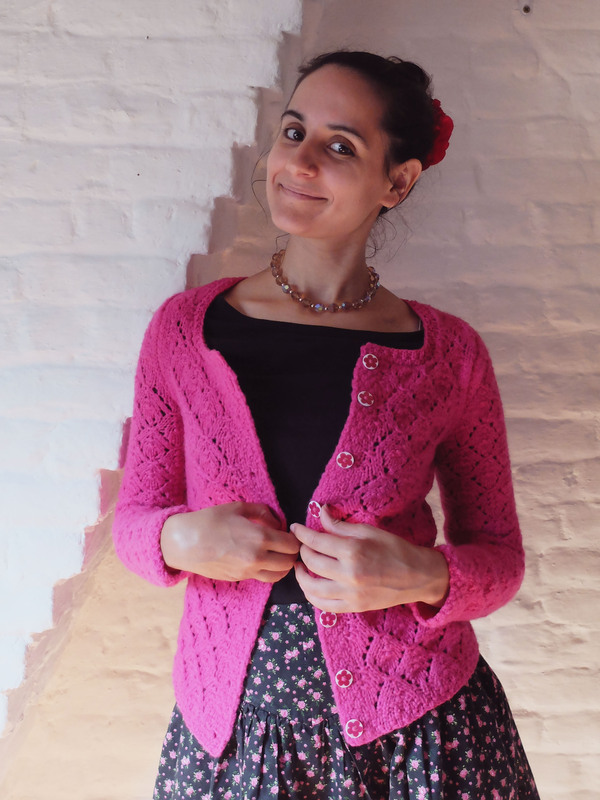 I’m knitting a cardigan at the minute for a present with cascade 220 and I’m really enjoying it, so maybe I will give this pattern a go next. It’s gorgeous! Thank you! 🙂 The Cascade 220 gauge doesn’t normally suit the gauge of the pattern, but I managed to get the correct gauge by going up a needle or two (I used 6 mm needles – 5 mm for the neckband). Oh, and fYI, for a size S with XS sleeves, I used about three skeins and a quarter. 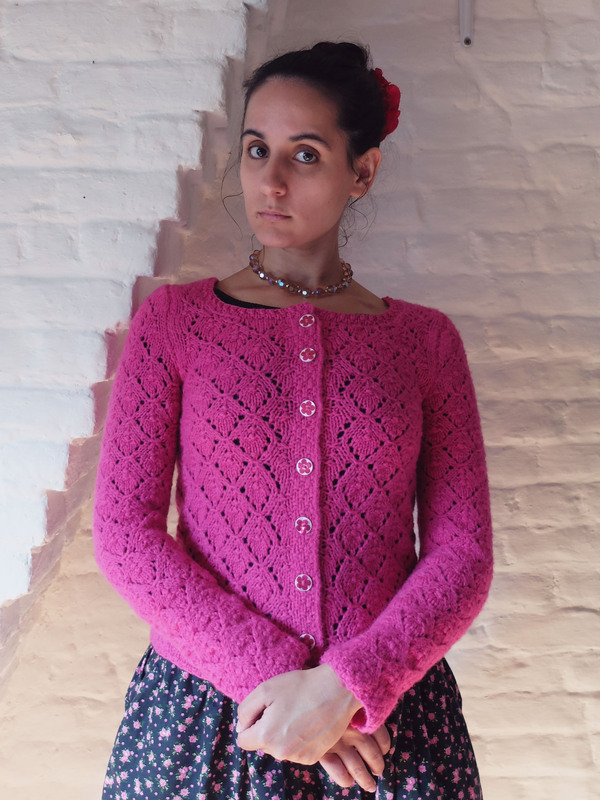 The cardigan is such a lovely complement to the dress you’re wearing, and the petersham ribbon stabilizer–especially the tidy buttonholes–is gorgeous. I love when the insides of a handmade item are as lovely as the outsides. It’s something I’m working to improve in my own knitting/sewing, so I very much admire your work. Thank you! 🙂 I like trying to get the tidiest possible result, but I also try not to fret too much when things don’t go as well as planned! 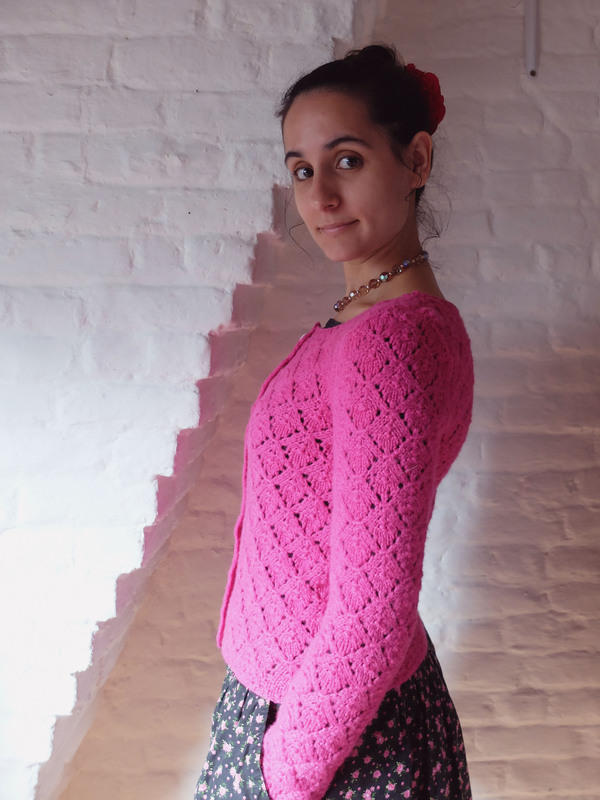 Two weeks in Spain knitting and reading – sounds ideal! Love the hand-stitching on the petersham, definitely worth it. This is absolutely stunning! I love the lace and the pink (my favorite color). You really make me want to make this pattern. I like that you added the buttonholes. It looks perfect. Thank you so much! You should make it, it’s such a beautiful pattern, and it’s not difficult at all if you take care to place stitch markers between every lace repeat! So lovely. Gorgeous colour and button bands. I finished hand stitching on some ribbon yesterday. It took me forever too! Not as neat as yours though! Well done! Thank you! Can’t wait to see your project! Gorgeous! 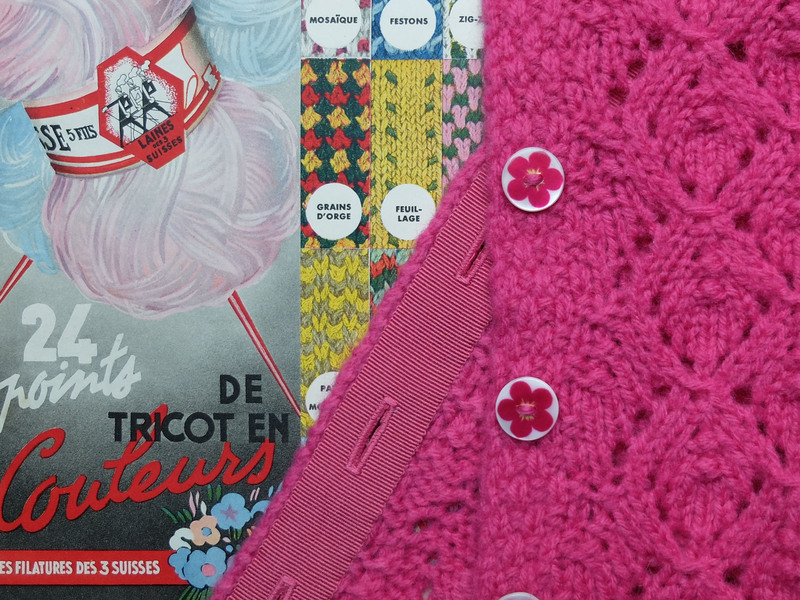 Knitted cardigans are endlessly practical, and the more you have the more fun you can have with the colours! This one is perfect.